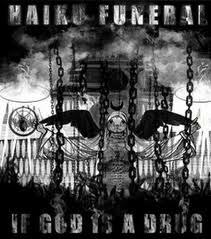 Haiku Funeral - "If God is a Drug"
Haiku Funeral is back with a very intense release. This is a limited edition CD released in a half size DVD case in only 50 copies. There are 12 tracks in 52 minutes. Haiku Funeral consists of Bulgarian black metal vocalist Dimitar Dimitrov (Corpus Diavolus, Glades of Gloom, Unhealthy Dreams) on vocals and electronics and American progressive/avant-garde bassist William Kopecky (Yeti Rain, Far Corner, Snarling Adjective Convention, Kopecky, etc) on bass and vocals. The opening Izkuplen is a very intense track. The sound is very abrasive, scary, loud and awesome. Wow… when the vocal kicks in, when you play this one loud, you really are affected, the way the abrasive production is layered with the more clear low end sound of William. The lyrics presented on the insert are also very intense and one Edgar Allan Poe story is used (City in the Sea). Holy Connection features William on vocals and a very deep dangerous bass and melodic keyboard at the start but then the sound progressively degenerates into this more distorted metallic sound. Quite a contrast from the first track. Fungoid Moon also has a dangerous low end and some super cool bass and windy synths. The track slowly gets quite spaced and evil. If God is a Drug makes up the next several tracks and has many moods, vocal layers and insanity. The 2nd part features some awesome bass playing once again. On the last part of the title track, Cveta does the howling witch voice as a special guest. The vocals are very intense on this track by Dimitar. There are a few short pieces before the final mind blower. This is very psychedelic, dark, heavy stuff and not for the weak of mind.